Steel Doors commercial office and telecommunication facilities to pharmaceutical and chemical plants, as well as military bases, transport hubs and leisure stadia. 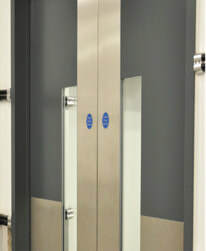 Timber Doors are approved by many governmental and military organisations to provide maximum security for high profile buildings at risk of attack. Each Safeguard door set offers advanced protection in discreet designs that will not attract unwanted attention. ​The correct hand of a door can be selected using this diagram. Standing inside the box looking out, choose your door hand from 1 to 4, determined by hinge side and if the door opens inwards or outwards. 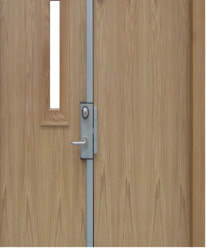 When viewing the door on the side where the hinge is visible, the door is either left or right hand hinged - for double doors, left or right hand active. The door is then described as either inward or outward opening. For Security, Blast and Ballistic doors, attack side should be identified. • Solid hardwood frame sections, with steel reinforcement in some door types. • Hardwood veneered, steel laminate and composite exterior facings. • Anti-drill plates available to protect doors fitted with panic or emergency exit hardware. • FD30(S) – FD240(S) in accordance with BS476 Part 22: 1987. • E30 – E240 in accordance with EN 1634-1: 2008.